Using a hand blender, you end up with a cup full of creamy, perfectly emulsified, real-deal, better-than-anything-you-can-buy mayonnaise. Mayonnaise is an emulsion of oil and water—two liquids that generally don't get along. The classic technique is tough. The solution? Use a hand blender. With a hand blender, you can add all of your ingredients—oil included—directly to the blending cup. By using a jar just wider than the head of the blender, the oil is gradually emulsified into the other ingredient. The oil floats at the top, so when you stick the blades of the hand blender down into the cup, they'll be in direct contact with the egg yolk, water, acid, and mustard. 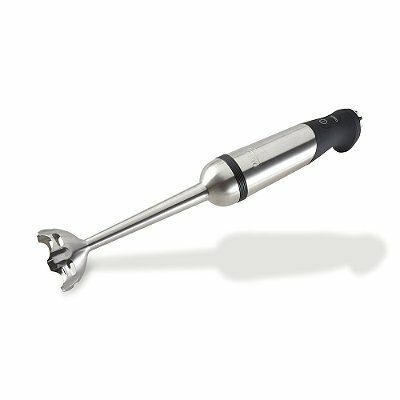 The immersion blender creates a vortex, gradually pulling the oil down into the whirling blades. Place egg, lemon juice, and mustard in the bottom of cup or jar that just fits the head of your immersion blender. This is vital. the circumference of the jar must be just larger than the head of your blender and the egg/lemon juice mixture must reach the blades for this to work. If the mixture does not reach the blades, double the recipe before attempting. Add garlic, if using. Pour oil on top and allow to settle for 15 seconds. Place head of immersion blender at bottom of cup and turn it on high speed. Do not pulse or move the head. As mayonnaise forms, slowly tilt and lift the head of the immersion blender until all oil is emulsified. Season mayonnaise to taste with salt. Store in a sealed container in the refrigerator for up to two weeks. UPDATE: So I called this "foolproof," but really, it ought to be called "fool-resistant," because even the most bulletproof technique fails now and again. Some people have reported that the mayonnaise never comes together when blending. The number one problem I've discovered is using the wrong jar. It is imperative that the jar be just slightly larger than the head of the immersion blender, as the egg/lemon mixture must be in contact with the blades of the blender before you switch it on for this to work. The head of the blender must be firmly planted against the bottom of the jar until the mayonnaise starts to come together. If you can't find a jar the right size, the other option is to double the recipe in order to increase the starting volume of the egg/lemon mixture. Finally, if your mayonnaise is watery, that means it has not emulsified properly, and no amount of additional blending is going to fix that. Your best bet is to let the mixture settle and separate, then try again.